Union, the Means and the End. Only an expansionist economy can combine defense and stability in Europe. Only European Union can provide the framework for expansion. Our Congress recognized this four years ago when it declared that the “economic integration and political unification” of Europe was a major objective of US policy. Since then a central currency pool has been created in the European Payments Union; a central planning staff, in the Organization for European Economic Cooperation; a central military command, at Supreme Headquarters of Allied Powers in Europe. A bank without credit has been opened in the European Assembly at Strasbourg. All these are advances within the outworn framework of separate nations voluntarily co-operating with each other. Holding Europe with voluntary committees is like building a dyke with a child’s sand toys. The committee system, as I argued a year ago, produces the maximum number of directives with the minimum effect. It offers no scope for leadership, so it attracts nonentities. On our innumerable committees with the exception of General Eisenhower, there is no one and there can be no one who bangs heads together and insists on results. The Defense Production Board of the North Atlantic Treaty Organization meets in London and grinds out reams of recommendations which fill the pigeon holes of Europe. The Finance and Economic Board meets in Paris and offers tentative reports. The Military Standing Group meets in Washington and serves chiefly to snarl up SHAPE, three thousand miles away at Marly. The Council of Deputies, with one exception, is made up of second, third and fourth rate men, picked by the separate foreign offices on the understanding that the council, like all committees, has no original authority and should have none. Since the decisions of all these bodies, although only advisory, must be unanimous, they cannot drive ahead but must search cautiously for the area of greatest agreement, that is, for the lowest common denomination of necessary action. The governments of Europe are pressed by the US to double their defense efforts. But they cannot finance rearmament as our government can. No government on the continent of Europe can finance rearmament by increased taxation alone. And since national finance markets have evaporated, no government can finance rearmament by selling its own bonds to its own people. Rearmament on a national basis means for Europe the printing press and inflation. Idle capacity still exists in Europe, and arms production is low. Italy would be delighted to produce military trucks and tanks for Belgian divisions; Belgium would be happy to make artillery for Italian divisions. But these divisions are not part of one army, and each country wants hard currency, or consumers’ goods in payment for its weapons, which the other cannot provide. Each country in Europe is still attempting to produce its own tanks, its own jet fighters, its own anti-aircraft guns. The result is poor weapons, produced at prohibitive costs. As costs rise and inflation mounts, each government, instead of moving closer to union, retreats within its own borders and seems crushed by the weight of its internal problems. The British Government is hypnotized by the shift in the terms of trade against Britain which results partly from American rearmament and which is as costly to Britain as the additions to her own defense program. France has suffered a 24-percent increase in the cost of living in the last 12 months and faces a budget crisis as her arms program shifts from budget bureaus to machine shops and payrolls. Italy is torn among inflation, unemployment, and shortage of foreign exchange. Germany is importing $10 million worth of coal each month from the US while her own production lags and Europe is starved for coal. Many of these problems would disappear if this whole area of Western Europe were one federal union. I believe this so strong that I do not believe real security is going to be felt in the United States, in the British Empire and other nations of the globe until it comes about. IF EUROPEAN UNION IS VITAL, which nations are to be joined? There are no clear dividing lines, and none of the existing organizations gives any clue for future federation. There are 10 nations in SHAPE; 12 In the NATO; 14 in the Council of Europe; 16 in the EPU; 18 in the OEEC. The authority given to each body varies and is generally set by the nation most reluctant to surrender sovereignty. In the Atlantic organizations the limits are set by the US, in the European organizations by Great Britain. Britain has refused to join a European federation, or to support one formed without her. She joined the Council of Europe principally to prevent its development along federal lines. On all committees she presses her concept of sovereign governments carrying out agreements that are voluntarily and unanimously reached. This approach, intolerably narrow for Europe, was accepted in the hope that Britain might advance to more ambitious plans. When it became clear that Britain’s attitude was rigid and reflected her needs, a break within Europe developed. A new concept is now emerging, of an inner and outer core of Europe, the outer core made up of Britain, the Scandinavian countries which support her, and the fringe nations; the inner core made up of France, Germany, Italy and the Benelux nations. In the decisive fields of heavy industry and armed forces, this inner-core group is now merging its separate sovereignties through the Schuman Plan and the European Army. The treaty creates a common market for coal and steel products in place of six protected markets. It eliminates restrictions on trade and transfers powers of domestic regulation to a new international institution. The High Authority, its executive body, is able to veto investments which can be maintained only through discriminatory subsidies. It is able to finance new investments. It allocates short supplies. It supervises fair wage and employment practices, prohibiting competitive wage cutting, and raising substandard wages. The High Authority in turn is responsible to a Council of Ministers, and to a Common Assembly, appointed by the parliaments of six nations. A Court of Justice reviews its work; a consultative committee brings in labor, management and consumer groups. The European Army, under which the Schuman Plan nations with the exception of the Netherlands give up their national armed forces to create a European force, is a still greater step, a decisive step, toward union, according to Hervé Alphand, the French delegate to the NATO. Under the present plan, European units will become one force in command, in reserves, in training, in equipment, in supplies and in air support. The air forces and the general staffs of the European units will be integrated. 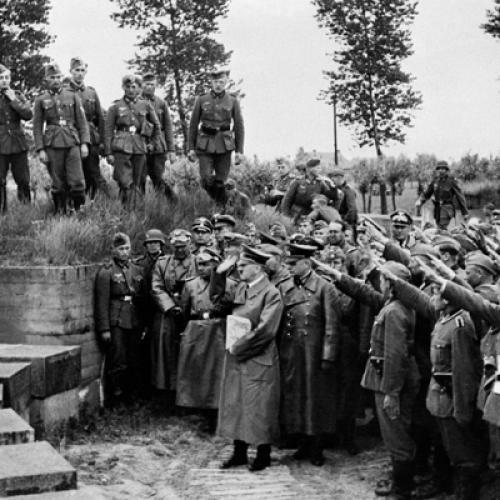 Common European schools will replace national military academies. In place of national defense ministries there will be a European Authority serving as a Ministry of Defense and responsible to the Council of Ministers, a European Parliamentary Assembly and a Court of Justice. A common fund will collect financial contributions and finance all expenses. A common system of supply and a common program for armaments production, providing standardization and specialization, will follow. By the end of this year, the European Army and the Schuman Plan should be in force. Both will compel further economic and political moves toward full federation. National budgets and defense programs will have to be brought under the central direction and review of a European defense minister. A European bank may be needed to finance an over-all program. Further agencies should follow to regulate transportation and trade. And beyond these courts, councils and assemblies of each plan will have to be supported by fully representative institutions which can command and direct loyalty of Europeans, and express their general will. However logical federation may be, it can succeed only if it rises from deep-seated impulse among the peoples of Europe’s inner core. That impulse is rarely found on the surface of Europe. Every official of a veterans’ organization, every candidate for public office, every bearded savant can still win applause by recalling ancient rivalries and outworn symbols that have drained Europe’s lifeblood and brought it close to death. Is it foolhardy to assert that this response is a reflex without great significance, a façade that will go down at the first thrust of a new idea? Culturally, for the peoples of the inner core, nationalism is a powerful, even a resurgent force but one which is local, regional and racial and does not wholly correspond to the states. Politically, nationalism offers no protection and little satisfaction. To take pride politically in being French, or German or Italian is to boast of having followed Hitler, Mussolini or Petain down the road to ruin. To cling nonetheless to political nationality is to ensure a shrinking status to perpetuate the privilege of being disregarded and overridden as minor considerations in the distant capitals of Moscow and Washington where major decisions are made. The impulse to union is a hidden and subterranean impulse. That is for the very sound reason that it arises from a sense of failure and defeat which few men will openly acknowledge. The nations of the inner core are nations which have suffered in common the overwhelming and humiliating experience of defeat and occupation. Naturally they will minimize and conceal the impact of this experience. But the truth is that the Schuman Plan is succeeding in spite of its economic provisions, just as the European Army is succeeding in spite of its military requirements because both projects are recognized as steps toward the reconciliation of Germany and France, whose continued rivalry no farmer or worker, father or son, in Europe, can any longer afford. The presence of this silent conviction is no guarantee that union will be achieved in time. The Schuman Plan has not yet been ratified. The European Army plan has not yet been finished. Uncontrolled inflation, or one false move, such as an election victory for de Gaulle, might destroy France’s capacity to provide leadership. In Germany, pitfalls line the road to federation. As an occupied power, the Germans have tried to set outrageous terms at each necessary step. When Eisenhower called the federal government’s bluff on the issue of rearmament it retreated and co-operated in the European Army plan. Yet the efforts of Adenauer to promote the concept of union have been blocked by the chauvinism of Schumacher’s socialists who have paid lip service to the idea of union, and fought tooth and nail against each measure of advance. Germany has recovered more rapidly than any European nation, thanks partly to $4 billion in US aid. Yet every proposal, to mobilize scrap reserves, to increase coal output, to ration raw materials, to provide land for troop maneuvers, put forward in the face of a common danger, has been opposed by Germany. NATIONAL SOCIALISM still flows as an undercurrent in Germany. And if a static approach is taken, then at any moment impressive facts can be arrayed, strong arguments advanced, and hot emotions aroused to block the transfer of added responsibilities to such an unreliable people. Yet, in the light of any long-range approach to Western survival and development, this static approach collapses. As long as Germany is defended, subsidized, supervised and quarantined by other Western nations, the German people are bound to be ruled by neurotic emotions of self-pity, apathy, hatred and desire for revenge. Assimilation is the only cure for German nationalism. A major objective of this generation is to help Germany reach a conscious and lasting commitment to Western values that are democratic and pacific despite all passing trends. This can happen only if Germans become Europeans, and, as members of a European Union, share its responsibility as well as its benefits. These responsibilities include the bearing of arms. The rebirth of the German soldier is, under any circumstances, a gamble. In German uniform, a German soldier seemed an intolerable gamble to Europeans. To them the thought of a German soldier in European uniform, though repulsive, is less repulsive than the thought of a French or a Belgian youth being drafted to defend Germany. This alternative of Germans paying taxes to support and equip a European Army without contributing manpower has been rejected. Yet German conscripts wandering through the market places and marching through the streets of Germany can set in motion consequences without end. One is the reawakening of German militarism. A second is the growth of an uncontrolled fear in Russia, which otherwise realistic Soviet leaders may fall prey to, and which they are certain to exploit. These dangers force the issue. European unity cannot be sacrificed on the altar of German neurosis. Nor can it be held up as the mask for German nationalism. If the Schuman Plan and the European Army are permitted to be no more than the façade for the re-creation of German industrial and military power they will be disasters. The insignia on the European uniform must symbolize a sovereign power deriving from a general consciousness, which German nationalism cannot by-pass or control. In time, given peace, Germany will achieve what Eisenhower called an “earned inequality.” Germany will belong to the NATO and SHAPE. And the capacity to wage war as a nation, now denied to Germany alone, will be denied to all members of a European Union. MEANWHILE there are clear limits to German independence and equality. No German will die for an occupation statute, said Schmid to all who wish to listen. But even in the replacement of the statute, by a contractual relationship, the allies will have to reserve final powers to station troops in Western Germany, to negotiate Germany’s Eastern boundaries in a peace treaty, and to protect the Western sections of Berlin. Eventually, within the European Union, there will be no national general staffs, military academies, court-martial systems or independent armed forces. Meanwhile France, Belgium and the Netherlands have military commitments overseas which a European Army, in the absence of a political union, cannot take over. IN TIME, institutions will develop where these issues can be resolved according to established rules of law. Meanwhile it is necessary for individuals to assume these responsibilities. Germany’s protest over France’s right to maintain an independent general staff will be resolved by SHAPE. That is possible not because SHAPE as an institution has the necessary authority but because Eisenhower as an individual possesses the necessary prestige. Eisenhower today is acting in many ways as the chief executive of Europe. He has been given powers which representative institutions alone should delegate because he symbolizes European unity and because he has persuaded Europeans that his purpose really is peace. His contribution is beyond praise. But the load he carries is far too heavy. No American mother would turn her son over to a general not subject to a Congress whose leaders she can help to elect. Why should a European mother act differently? Except through some personality, law may never come to life. But personality is no substitute for law. The problems which Eisenhower faces, he cannot resolve for an indeterminate future. They can be resolved only by making it clear that they are the problems of transition and the transition is toward European Union as a clearly defined goal. It is no longer enough simply to affirm this goal. Like recovery under the Marshall Plan, its key is an established timetable which requires open commitments and sets promise and performance side by side. Yet institutions are not and cannot be ends in themselves. A timetable for federation will succeed only if federation is part of a broader program that adds up to a new life for Europe. Michael Straight served as editor-in-chief of The New Republic from 1948-1956. This article appeared in the September 24, 1951, issue of the magazine.